When a property has a reputation for great food, it's because the kitchen cooks are doing an outstanding job. They are skilled in preparing food, using kitchen equipment properly, and ensuring that everything is kept safe and sanitary to put the highest quality food on each plate. 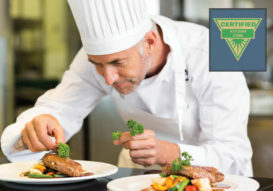 The Certified Kitchen Cook credential recognizes that kitchen employees who are committed to high standards in everything they do. Candidates should complete the START for Kitchen Cook training to prepare for the certification exam. The training is available in an online package with certification exam for individuals, or in print for group training. START for Kitchen Cook is intended for employees/trainees in a classroom setting. It does not require an on-the-job training component. quickSTART for Kitchen Cook is intended for on-the-job employee training or for trainees with access to a hands-on learning lab or internship where there are opportunities to perform job tasks. Those who complete the START or quickSTART program for Kitchen Cook are prepared to take the Certified Kitchen Cook certification exam. The certification exam consists of 30 multiple-choice questions.